While many Island Health facilities feature some form of all-nations room, the North Island Hospitals Project is offering new opportunities for these special places; the opportunity to improve on earlier designs and the opportunity to develop more comprehensive guidelines around use of the rooms. ￼Click on the images below for more information. The North Island Hospitals Project created an Aboriginal Working Group in 2012 to help design hospitals that reflect Vancouver Island First Nations and Métis cultures, community history and values, and incorporate the work of local artists. 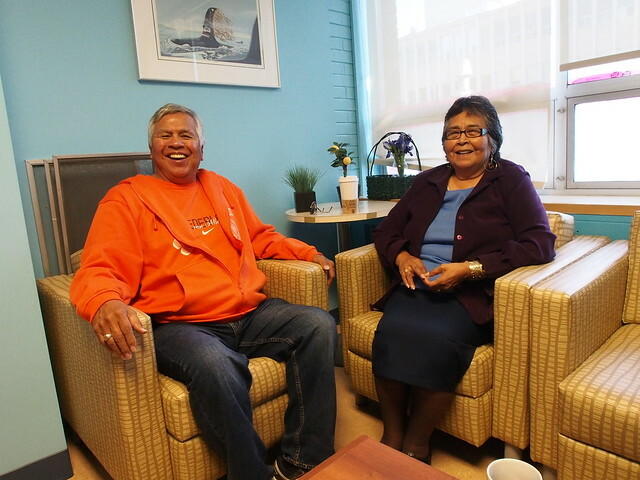 Both new hospitals will feature a special room or “Gathering Place ” located next to the hospitals’ main entrances, providing a culturally safe, spiritual and non-denominational place for people of all nations. Aboriginal Working Group member James Quatell wants people to know that while the Gathering Place designs recognize the mid and North Island’s rich Aboriginal cultures, the rooms are for use by people of all cultures. The Wei Wai Kum Nation Elder fears the public and hospital staff will assume the rooms are only for use by Aboriginal people. It’s not called the First Nations Room, he says, but the Gathering Place. Quatell joined the NIHP Aboriginal Working Group after seeing the welcoming ceremony for the new Campbell River District Hospital in 2013, prior to construction. Dr. Evelyn Voyageur, a nurse/instructor and member of the Tsawataineuk First Nation of Kingcome Inlet, came to the Aboriginal Working Group through a different path. She’s a North Island College instructor and also sits on the board of St. Joseph’s General Hospital. “I attended some (of the early Aboriginal Working Group) meetings and I was very vocal,” she smiles. “If things are not the way they should be, I will say it. Thanks to input from Aboriginal Working Group members, the Gathering Place designs include a larger exterior view to maximize natural lighting, as well as direct access to an outdoor garden area with traditional medicinal plants. The rooms have flexible spaces and systems to accommodate a wide variety of ceremonies for any cultures. For example, the Gathering Places have additional sound proofing and an independent ventilation system to accommodate music, drumming and smudging ceremonies. The rooms will have separate entrances for patients and public. They’ll feature lots of cedar, fireplaces, and colour schemes consistent with those of North Island First Nations. In another improvement on earlier designs and existing All Nations rooms in other facilities, North Island Hospitals Project Gathering Places will have additional space for the secure storage of ceremonial items. Both Quatell and Voyageur say the inclusion of Aboriginal cultures and values in the hospital designs is good news, but both are also eager to see how the Gathering Places will be used once the hospitals are built. They feel the room at the existing Campbell River Hospital has been under used and misunderstood. Too often the room sits empty, perhaps because hospital visitors, patients and staff feel it is only for Aboriginal people to use. Quatell says that’s got to change. There’s no turning back. She’s hopeful that the design process for the new hospitals and the Gathering Places will translate into more cultural awareness and flexibility when it comes to developing guidelines for how the rooms are used. Indeed, guidelines for use of the new Gathering Places have not yet been determined, but Island Health will continue to work with the Aboriginal Working Group, clinicians and others to develop guidelines consistent with the all-inclusive spirit of these special spaces.